A new video podcast, The Rest of Everest documents a 2003 expedition to the Northeast Ridge route to the top of Mount Everest. The video podcast, created by documentary filmmaker Jon Miller of TreeLine Productions in Colorado, is ‚Äúthe rest‚Äù of the footage from the expedition documentary Everest: The Other Side, which premiered on Dish Network Pay-Per-View in May of 2005. 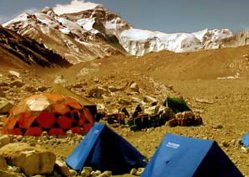 The film and video podcast document the 2003 expedition to the Northeast Ridge route in Tibet, and coincides with the 50th anniversary climbing season. The story revolves around 23-year old climber Ben Clark and the fulfillment of his dream to become one of the youngest climbers to ever summit Everest.